Paraffin embedded human gastric cancer tissue was stained with Mouse IgG2a-UNLB isotype control (SB Cat. No. 0103-01; left) and Mouse Anti-Human MMP-9-UNLB (SB Cat. No. 12025-01; right) followed by Goat Anti-Mouse IgG2a, Human ads-HRP (SB Cat. No. 1080-05), DAB, and hematoxylin. ELISA plate was coated with serially diluted Mouse IgG2a-UNLB (SB Cat. No. 0103-01). 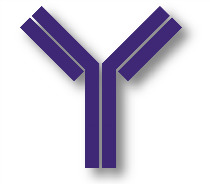 Immunoglobulin was detected with Goat Anti-Mouse IgG1, Human ads-BIOT (SB Cat. No. 1070-08), Goat Anti-Mouse IgG2a, Human ads-BIOT (SB Cat. No. 1080-08), Goat Anti-Mouse IgG2b, Human ads-BIOT (SB Cat. No. 1090-08), Goat Anti-Mouse IgG3, Human ads-BIOT (SB Cat. No. 1100-08), Goat Anti-Mouse IgA-BIOT (SB Cat. No. 1040-08), and Goat Anti-Mouse IgM, Human ads-BIOT (SB Cat. No. 1020-08) followed by Streptavidin-HRP (SB Cat No. 7100-05) and quantified. Paraffin embedded human kidney cancer tissue was stained with Mouse IgG2a-UNLB isotype control (SB Cat. No. 0103-01; left) and Mouse Anti-Human MMP-3-UNLB (SB Cat. No. 12020-01; right) followed by Goat Anti-Mouse IgG2a, Human ads-HRP (SB Cat. No. 1080-05), DAB, and hematoxylin.